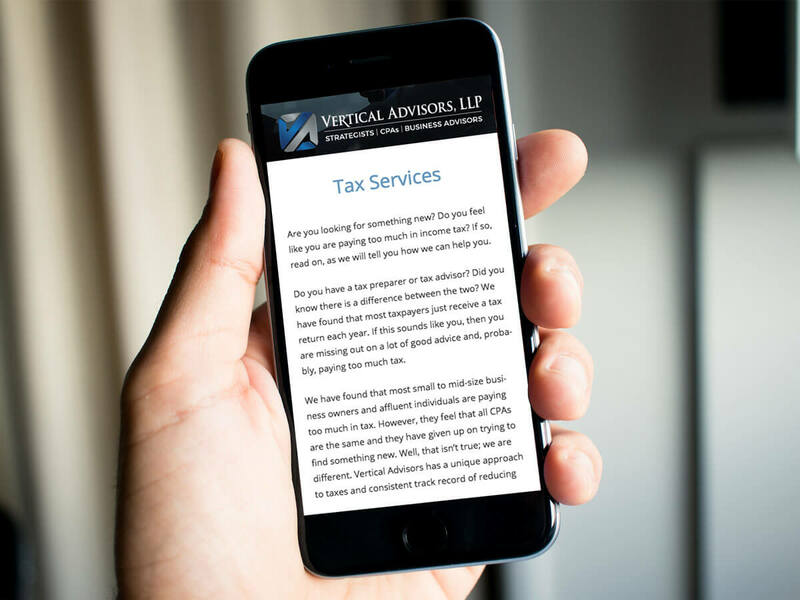 Vertical Advisors (VA) is a boutique accounting firm specializing in providing privately-held companies with accounting, taxation, and business advisory services. Their goal was to have their services easily recognized on the web plus keep their users engaged. Our website design Orange County team came up with a ultra clean, modern website that can be easily viewed across multiple platforms. VA’s WordPress website was designed to look polishedand professional on a clean contemporary platform. Playing on the use of blue undertones against dark grey; sections, icons, callouts, graphical elements, and photographs all support the same cool polished tones. Motion graphics, modern typography, large photographs and the abundance of white space are usedto keep the users engaged. The overall layout is clean, simple and easy to navigate.